The U.S. House Courts, Intellectual Property, and the Internet Subcommittee hearing on the PARTS Act, House Resolution 1057, on Tuesday should still be available for replay. We’ll do our own coverage and analysis, but repairers might want to take a look at the stances offered by various U.S. representatives on the committee, CAPA (there to represent the Consumer Federation of America), an aftermarket supplier, an intellectual property attorney, and the Automotive Service Association. The House’s original version is here. The latest iteration of the law would prevent automakers from enforcing patents on the appearance — but not the function — of parts after only 30 months. Right now, any design patents issued by the government are good for 14-15 years. It would only apply to OEMs — no other industry, including the aftermarket. 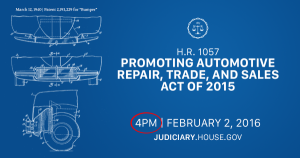 Featured image: The U.S. House Courts, Intellectual Property, and the Internet Subcommittee hearing on the PARTS Act, House Resolution 1057, should begin at 4 p.m. Feb. 2, 2016.